Luca Cumani’s God Given was beaten just a short head by the reopposing Horseplay in the Lancashire Oaks at Haydock in July before finishing fourth behind Pilaster, the 6-5 favourite for this Group Two affair, in the Lillie Langtry at Goodwood. Having finished third in a French Group Two on her most recent outing, God Given was a 5-1 shot under Jamie Spencer and made her move racing inside the final quarter-mile. Horseplay held a narrow advantage racing inside the final furlong, but God Given wore her down to gain her revenge by a neck. Having been held up last by Andrea Atzeni, Pilaster made late headway to finish a clear third, with Flattering faring best of Aidan O’Brien’s two Irish raiders in fourth. Cumani said: “After the Lillie Langtry, when she was a bit keen in front, we thought we’d have to be a bit careful over this mile-six and as there was a leisurely pace with the Aidan O’Brien second string, we just sat away and went and did battle on the straight. He added: “Ascot (Champions Day, Fillies and Mares Stakes) next. The plan was if she didn’t win today we’d have gone to France form a Group Two on Arc weekend, but now she’s got that Group Two there’s no point. Andrew Balding said of runner-up Horseplay: “She’s run a great race. Obviously the 3lb penalty has paid, but she battled all the way and I’m delighted with her. Roger Varian added of third-placed Pilaster: “The lack of pace hindered us. She was closest at the finish and just got out-sprinted a little bit. Often referred to as “the fillies’ St Leger”, the Park Hill Stakes was established in 1839 for three-year-old fillies over the St Leger distance which was then one mile, six furlongs and 127 yards. The race was opened up to older fillies and mares in 1990. The first running went to the John Scott-trained Mickleton Maid. 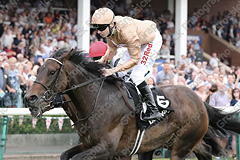 Scott went on to saddle seven winners of the race in all, a record matched only by Sir Noel Murless. The most successful current trainers are Luca Cumani and Sir Michael Stoute with four wins each. The Park Hill Stakes was upgraded from Group Three status to Group Two ahead of the 2004 contest won by Godolphin’s Echoes In Eternity.